3D printing is no longer just a figment of your imagination. This remarkable technology is coming to the masses with the growing availability of 3D printers. 3D printers create 3-dimensional layered models and they allow users to create prototypes that use multiple materials and colours. This friendly-but-straightforward guide examines each type of 3D printing technology available today and gives artists, entrepreneurs, engineers, and hobbyists insight into the amazing things 3D printing has to offer. 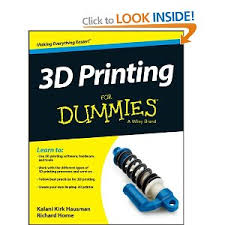 You’ll discover methods for the creation of 3D printable objects using software, 3D scanners, and even photographs with the help of this timely For Dummies guide. Link to Amazon see inside. P.S This is good, but Now. Come to my conferences later this year!